The Irish people have been thanked for their generosity in helping to establish a pioneering care centre for mentally and physically challenged children in rural India. A STATE OF THE ART rehabilitation centre for mentally and physically challenged children has been opened in southern India with the help of €3.4m funding from Irish not-for-profit charity Gorta. The multipurpose centre will offer services to young people living with a wide range disabilities, many of whom have been excluded from formal education and therapy due to the complicated nature of their conditions and enduring social stigma. Poor health education and a lack of quality prenatal care in rural India have contributed to a notably high number of children born with significant – but preventable – disabilities. Added to this, insufficient government assistance to poverty-stricken groups leads to the educational, social and psychological needs of many children being neglected – exacerbating the severity of their conditions and leaving them unequipped for independent living. India’s high level of disability stems not only from poor healthcare but also a culture of intermarriage which leads to a high number of congenital disorders. Nowhere is the effect of the combination of poor education and policy failure more evident than among the country’s rural poor: widespread, extreme poverty means many families simply do not have the resources to give appropriate care to children with special needs, condemning them to a life without the possibility of proper education or dignified employment. 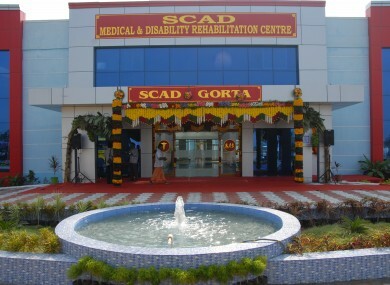 The SCAD-GORTA Medical and Disability Rehabilitation Centre is the first of its kind in the southern Indian state of Tamil Nadu; it offers an individually-tailored, holistic approach to therapy for young people living with a range of disabilities, including multiple disabilities. Services include speech therapy, play therapy, physiotherapy, hydrotherapy and occupational therapy, with the aim of helping young people learn to live with their challenges and reach their full potential. Mindful of the need for a multifaceted, community-wide approach to helping children with special needs, the centre also provides a teacher training programme to teach educators from mainstream schools about the best methods of nurturing the educational, social and emotional development of children with disabilities. A prosthetics manufacturing workshop is also situated on campus to cater quickly to children in need of physical aids. The centre, opened with significant funding from Irish aid NGO Gorta, will be run by local Indian development charity SCAD (Social Change and Development). Speaking at the inaugural opening of the centre in Ponnakudi, Tamil Nadu, on Wednesday SCAD founder Cleetus Babu thanked “Ireland and the Irish people for their help and generosity”, saying that approximately 40,000 people in need would benefit from the much-needed centre. Gorta has supported SCAD in Tamil Nadu state since 1989 on a range of community development initiatives. Former Chairman of Gorta and retired Trinity professor Joseph Haughton travelled from Ireland to attend the ceremony at the age of 93, accompanied by his wife Helen. Haughton, who first set up the partnership between Gorta and SCAD in the 1980s, was honoured for his long-standing commitment to bringing help to disadvantaged people in the southern Indian state. An integral partner to this much-needed project, Haughton told the packed auditorium: “My wife and I are deeply privileged to be here today on this very happy occasion”. More Irish-based assistance for the project came from Cork services company PM Group, which provided pro bono expert project management and engineering advice for the 11,353 sqm of buildings as part of its Corporate Social Responsibility Programme. PM Group CEO Pat McGrath spoke at the centre’s inaugural opening, praising the “tremendous partnership” that existed between Irish and Indian groups during construction – and underlining the emphasis on the need for young people with special needs to be treated with dignity and respect. The centre was built with an emphasis on ease-of-use for challenged children, as well as the use of local construction materials and maintenance practises – one example of this is the lack of elevators in the complex, which are costly to run and repair in rural India, with ramp access instead used between all floors. The centre was also constructed with a focus on sustainability and on green power, using solar energy to power streetlights, according to McGrath. All food scraps and organic matter are placed in a biodigester unit which converts waste into natural gas that provides electricity to the complex; sewage waste is converted into water which, along with harvested rainwater, is used for the site’s grounds and sensory garden. Following European standards, SCAD says the centre will provide care for approximately 260 children at anygiven time – with 80 in short-term residence, 100 in day care, and 80 in vocational training. Some 123 staff will be employed in therapy, training, manufacturing and catering roles. Speaking at the opening ceremony, Chairman of Gorta Sean Gaule thanked those at PM Group for dedicating several years to the project: “The easiest thing for PM Group to do would have been to donate some money, which of course would have been very welcome. However, Pat and his colleagues gave us something even more valuable: their expertise”. Gaule said Gorta had worked in the region for 24 years and that he and his colleagues felt “extremely proud” to be partner in a project that will help so many children lead self-sufficient lives. Email “€3.4m funding from Gorta gives new hope to disabled youth in India”. Feedback on “€3.4m funding from Gorta gives new hope to disabled youth in India”.